This page is separated into different subsections which are highlighted on the screenshot below. 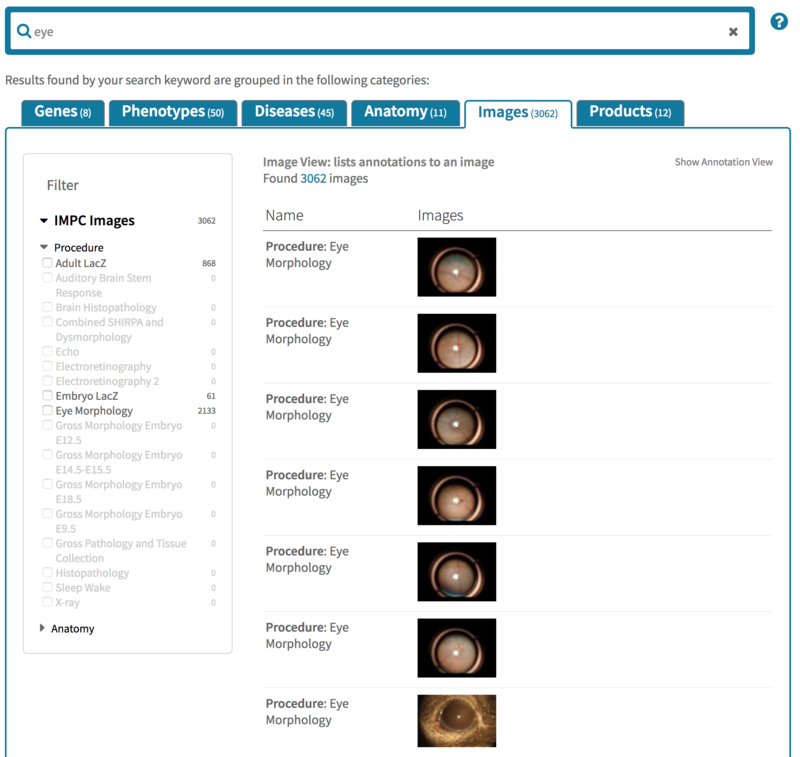 Currently, the IMPC portal supports 6 main datatypes on the search page: Genes, Phenotypes, Diseases, Anatomy, Impc Images, and legacy Images. Each main datatype has filters to allow for data filtering. The selected one is highlighted in dark blue. The ones w/o results will be grayed out. The user is in control of whether a filter is open or closed by ticking on it. Filter options will change according to datatypes and will dynamically count data corresponding to user's filtering choice. The counts of non-matching filters will become zero and disabled (grayed out). Enter at least 3 letters to invoke a drop-down list of terms related to your search keyword. The results will be prefixed by a datatype which are described in the table below. The top ten most relevant terms will be shown, in order of relevance scores. You can select the desired term by using the UP/DOWN keys or by selecting the term with the mouse and pressing the ENTER key. When a main datatype is chosen (Genes, Phenotypes, Diseases, Anatomy), typing a keyword in the main input box and hit ENTER w/o choosing an item from the dropdown list will show the result with the same main datatype selected. 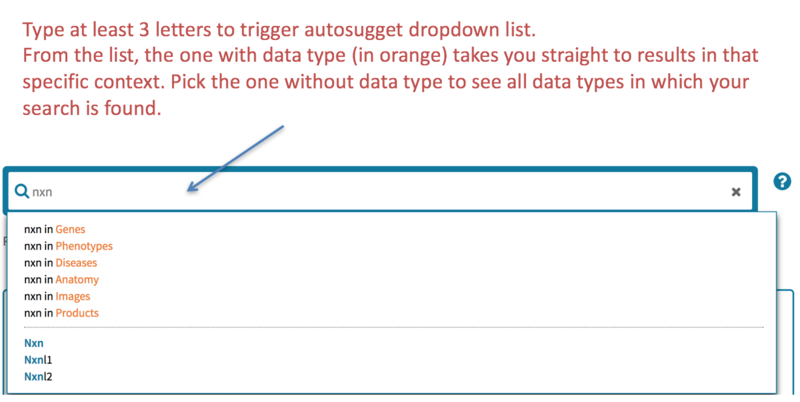 However, when you specifically choose an item from the dropdown list, the selected datatype will be the one associated with the selected item. The table shows the possible datatypes currently searchable. at the bottom-right corner of the results grid. For more information about the page layout and the basic search functionalities please consult the Generic Search Features tab. First, click on the "Genes" datatype tab. It will show all the genes that IMPC knows about if no filters are ticked on the left panel. 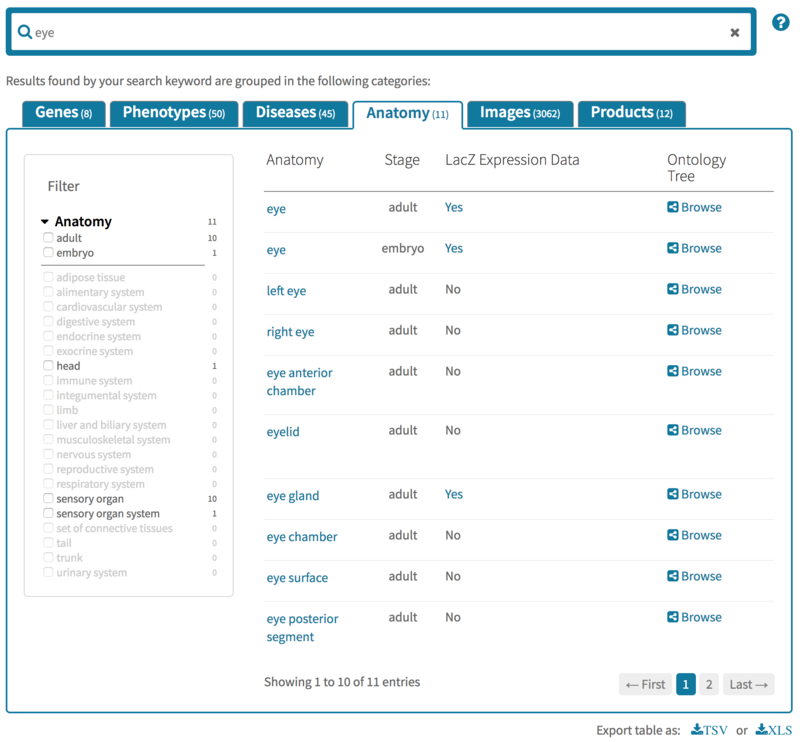 You could enter a gene symbol/ID/name or human orthologue into the main input box and/or click on a filter on the left panel to narrow down your result to relevant gene(s). The filters on the left are grayed out if they are not related to your search. The IMPC Phenotyping Status facet is open by default and has three sub-facets and are progressive. (1) Approved means completed status. Ie, phenotyping procedures agreed among the IMPC phenotyping centers have been completed. (2) Attempt Registered means phenotyping centers have plans to carry out the phenotyping procedures. (3) Started means a phenotyping work has been started. Register The "Interest" link takes you to login page if you have not. Once you have logged in you will be taken back to this column and the label will be changed to "Register interest". 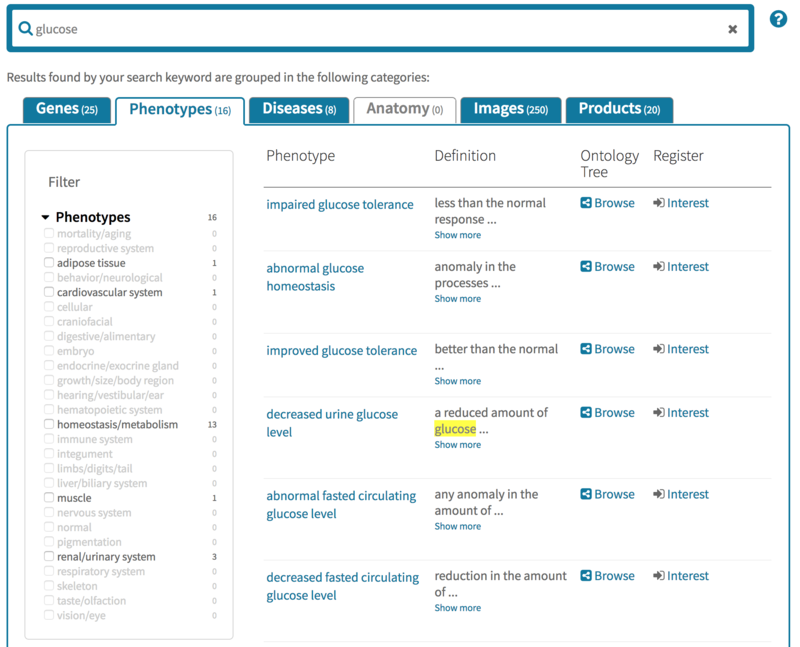 Firts, click on the "Phenotypes" datatype tab. It will show all the mouse phenotypes that IMPC knows about if no filters are ticked on the left panel. 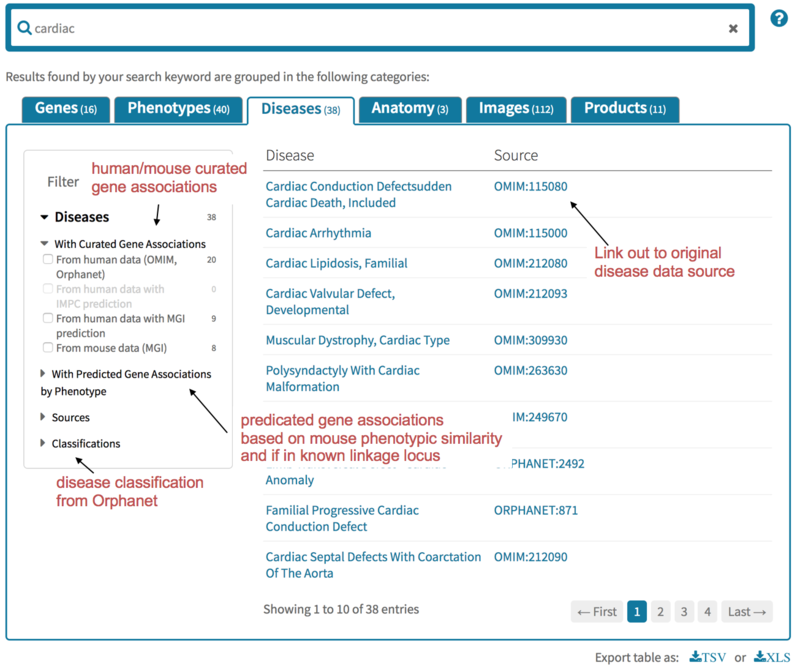 You could enter a human or mouse phenotype (either by text or by ID) into the main input box and/or click on a filter (all top level mouse phenotype ontology terms) on the left panel to narrow down your result to relevant phenotype(s). First, click on the "Diseases" datatype tab. It will show all the diseases that IMPC knows about if no filters are ticked on the left panel. 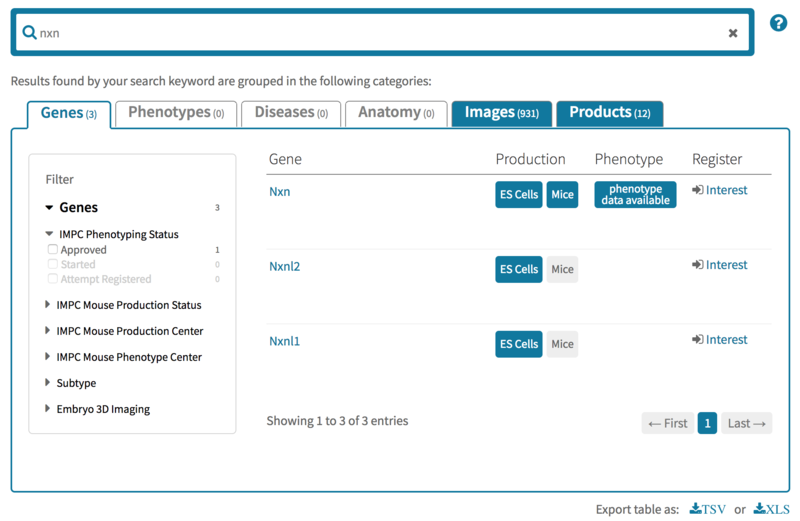 You could enter a human disease ID/name into the main input box and/or click on a filter on the left panel to narrow down your result to relevant disease(s). Disease This column shows the human disease name from OMIM/DECIPHER/ORPHANET with a linkout to the IMPC disease page. First, click on the "Anatomy" datatype tab. It will show all the anatomy terms that IMPC knows about if no filters are ticked on the left panel. You could enter a mouse anatomy ID/name into the main input box and/or click on a filter (all top level mouse anatomy ontology terms) on the left panel to narrow down your result to relevant anatomy term(s). Currently, there are two major types of images. The "IMPC images" (the IMPC Images datatype) and the legacy ones (the Images datatype). The Images datatype is legacy data from previous Europhenome/Eumodic phenotyping projects. As both datatypes can be searched by similar interfaces, the document here refers to the "IMPC Images" datatype. First, click on the "IMPC Images" datatype tab. It will show all images that IMPC knows about if no filters are ticked on the left panel. 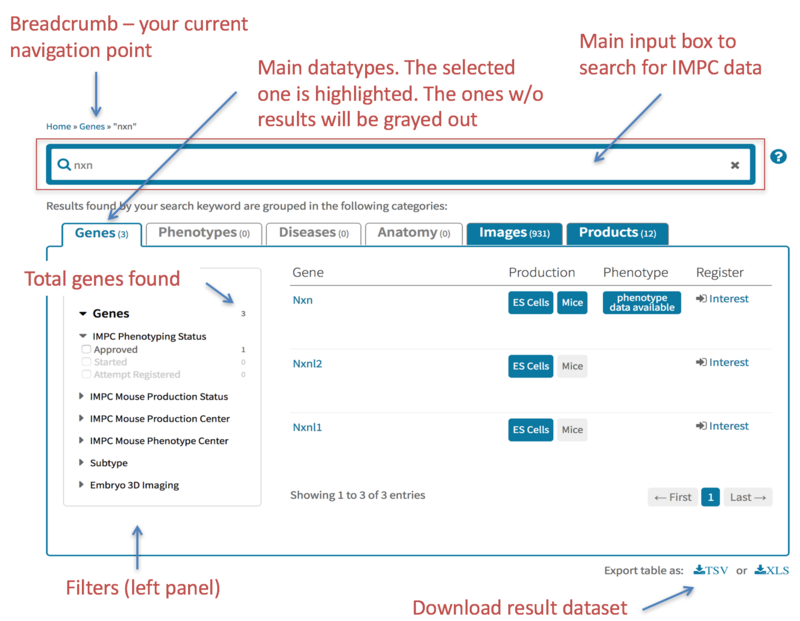 You could enter a mouse anatomy ID/name or procedure name from IMPReSS into the main input box and/or click on a filter on the left panel to narrow down your result to relevant IMPC images. IMPReSS contains standardized phenotyping protocols essential for the characterization of mouse phenotypes. There are two ways to view images data: Annotation View and Image View. 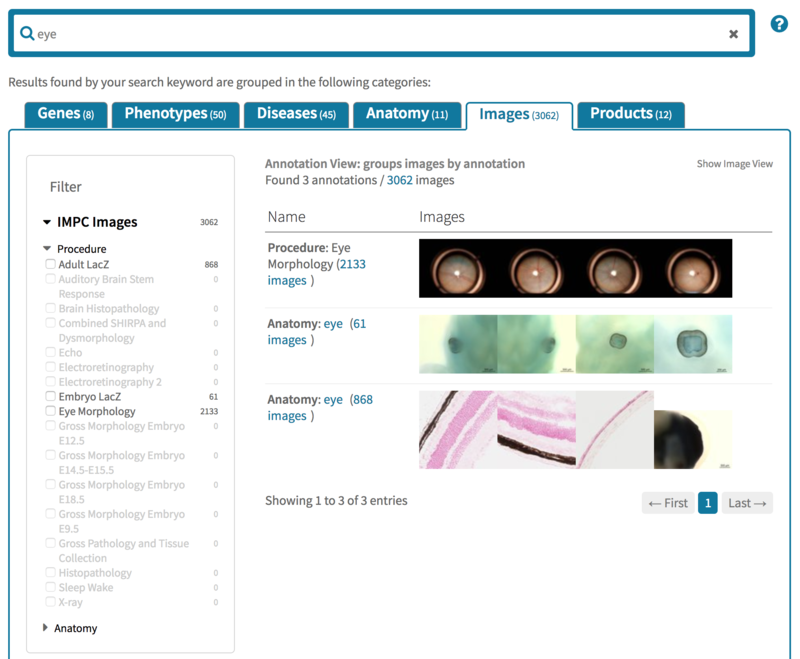 The former groups images by annotations which can be genes, anatomy terms (MA) or procedures. 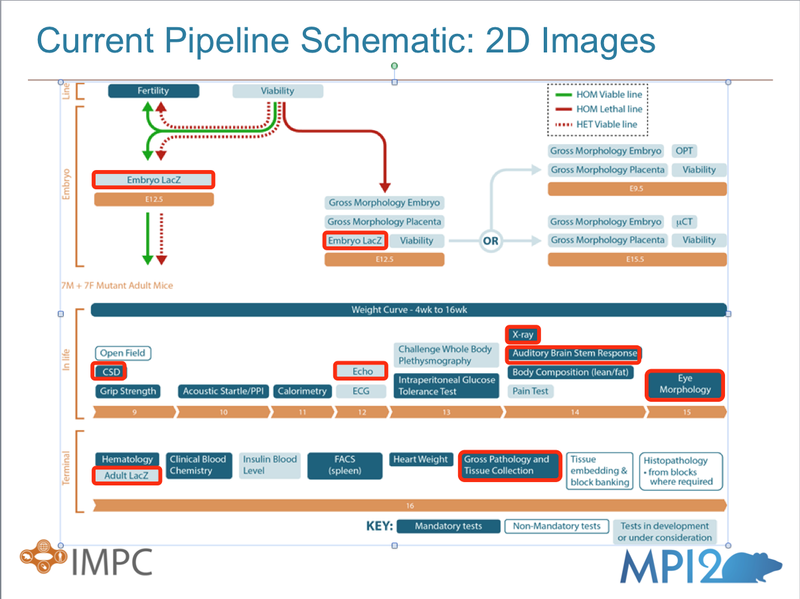 The latter lists annotations (genes, MA and procedure) to an image. To list annotations to an image, simply click on the "Show Image View" link in the top-right corner of the results grid. The label of the same link will then change to "Show Annotation View" so that you can toggle the views. This column shows name of an annotation and the number of annotation-associated images. IMPC Images are from the IMPC standardised IMPReSS procedures. The procedures highlighted in red below have image data collected. Data has been analysed by statistical methods (labelled "IMPC images" in the web portal). The web portal also contains legacy data from the MGP project at the Wellcome Trust Sanger Institute where the terms were manually annotated by researchers (labelled "Images" in the web portal). How often are images updated? IMPC images are released with the other data in the portal roughly every three to four months. Images from the MGP resource at the Wellcome Trust Sanger Institute are updated as needed at the same time as IMPC data is collected. How do I get image data / download? Individual images may be downloaded by clicking on an image in the normal view where a larger popup image is then displayed together with the option of downloading it underneath. Individual images can be downloaded from the comparison view (Control images vs experimental). Download links are displayed next to other annotations underneath each image. A spreadsheet containing information and links can be downloaded using the "download" link on the top right corner of the search results. See the gene page Expression documentation for more information on gene page expression images. See the gene page Associated Images documentation for more information on gene page associated images. Firts, click on the "Products" datatype tab. It will show all the alleles that IMPC knows about if no filters are ticked on the left panel. 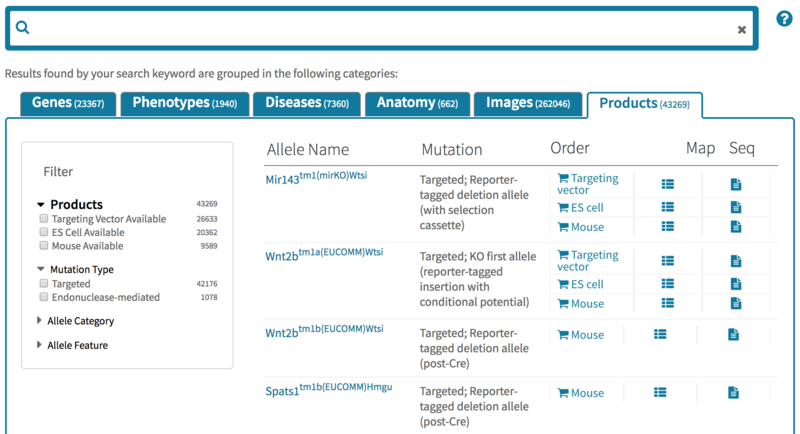 You could enter a mouse gene name (either by text or by ID) into the main input box and/or click on a filter on the left panel to narrow down your result to relevant allele(s).